Posted May 31, 2015 by Heather Michet & filed under DIY, Health Tips, Recipes. Smoke from a wildfire, too much computer time or hashing through tax prep documents can leave your eyes puffy, painful and non-functioning. They need some lovin’ for all of the work they do! 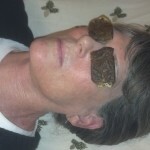 Treat them to some R & R (rest & rejuvenation) with this soothing eye treatment straight from the pantry. As an added bonus, your brain will appreciate the break and you’ll return to your tasks with more clarity. Place tea bags in small ceramic or glass bowl or cup. Add water and gently move tea bags around in water with spoon for about 3 seconds to ensure that the tea is drenched. Remove bags from bowl and squeeze most of the liquid out of them until they are neither drippy nor dry. Lie down on your back in your favorite spot. Place one tea bag flat against each of your closed eyelids, ever so gently patting it down into the socket to create an eye pillow. Make sure the bag has cooled a bit so that you don’t burn this delicate skin. That wouldn’t be too relaxing! Rest easy in the quiet, breathe deeply from the belly and send thoughts gratitude-filled thoughts and appreciation to your beloved eyes. They deserve this pampered rest and so do you. *Don’t try to “healthify” this recipe by using green or herbal tea in place of the black tea. The black tea has loads of tannins that reduce inflammation and have a soothing, healing effect on your tired orbs that non-black teas do not possess.